There has never been a moment in my life when I found myself watching a movie and wanting a sequel. Has this ever happened to anyone? Are there people who sit in dark theaters and secretly hope the film they’re experiencing will essentially be sold to them again? It’s a bizarre aspiration, even when the original artifact is amazing. It’s a straightforward desire for something that isn’t wholly creative; it’s like wanting something new, but not remotely unknown; it’s a little like contacting an ex-girlfriend and asking if you could date her younger, louder sister. Yet sequels are the backbone of modern Hollywood. They’re the tentpole movies that make the rest of the industry solvent. They are the only projects that everyone understands immediately, and they succeed by pushing expectations in two different directions: They increase personal engagement (by giving the audience characters and ideas they already understand) while decreasing critical pressure (since everyone naturally assumes a sequel won’t be better than the film that precedes it). It makes commercial sense on every level. The only problem is that — outside of a few notable exceptions — they end up being terrible, terrible movies. So we’re looking for the notable exceptions. 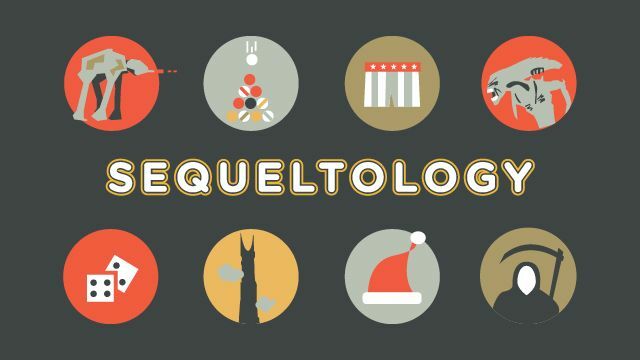 As part of Grantland’s ongoing attempt to answer all the questions no unhigh person has ever asked, we’re launching “Sequeltology,” an imaginary word that somehow explains this project impeccably. We are trying to isolate the greatest cinematic sequel ever made, based on your willingness to vote for whatever you believe to be true. At this point, I feel like the process is self-explanatory: Study the brackets. Follow your gut. Be true to yourself and live forever. Perhaps you are wondering, What are the criteria here? Am I selecting whichever film is simply the most entertaining, or am I selecting the film that best serves as an extension of the original story? I suppose an argument could be made that the “greatest sequel” is technically the movie that adds the most to the film it’s based upon (and thus improves its precursor retroactively). It’s a valid contention. But fortunately for you, we spent so much time arguing over which films should be included in the tournament that we never discussed this question at all. Do what thou wilt shall be the whole of the law. There’s one obvious, unavoidable conundrum within this bracket (at least to me): The Godfather: Part II is (arguably) the greatest American film ever made. It’s so much better than every other movie on this list that it sort of seems idiotic to place it up against the likes of Hellboy II. But still — let’s see what happens. We can’t pretend it doesn’t exist, and maybe I’m misjudging our readership. Perhaps the people who read Grantland don’t like The Godfather: Part II. Perhaps they hold conflicting views on secret abortions and gold telephones. well, check back later today … we’ll have a full explanation). There is such a thing as “sidequels,” which actually sounds like the sequel to the OTC medication NyQuil. Teen Wolf Too is ineligible due to its attempt to popularize team collegiate boxing. Knots Landing is ineligible because it was not a movie. The tournament begins right now, on Grantland’s Facebook page.